I’m sure this will go about as well as most boarding actions do against these people. Bikkie? At this point even Joyce could kick the crap out of just about anybody, and Pilot’s no slouch either. Pilot has given me an Ursula Vernon vibe this whole time, but I wasn’t sure until the Digger Facepalm. Glad you mentioned Ursula Vernon’s Digger. I’m always on the lookout for good (great actually) webcomics. What I’ve read so far has me captivated. Thanks. And we know something they don’t. Boarding like that can be hazardous to your health! 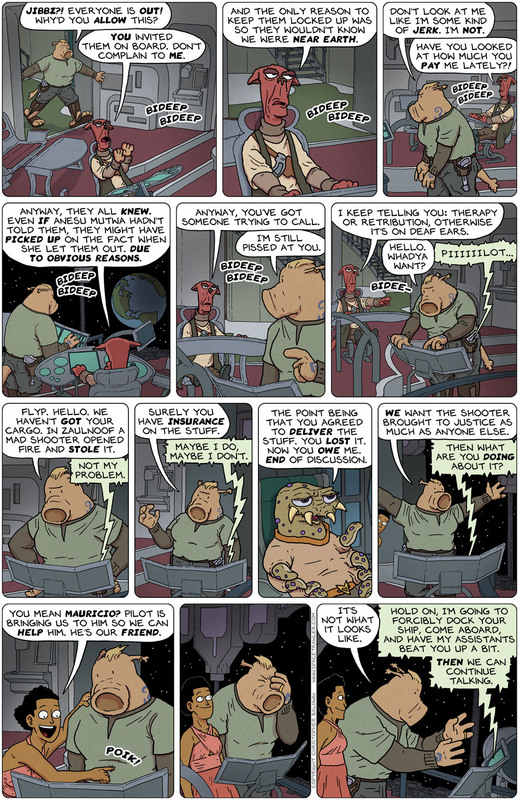 At some point about a couple years ago, I read all through the first major story of Spacetrawler, and thought the comic was more or less done because that was what it had. I came back to it yesterday, and found what I could believe was a miracle to me. It’s still going! My feelings can’t even now. Neither can we! I hope Nogg keeps picking Earth crew as needed for many more years to come. Pilot doesn’t realize Anesu is doing her a favor, luring her foe into a trap. Anyone want to lay wagers on how many panels it will take before “Anesu strips Flyp’s ship”? I just realized Flyp is wearing a Star Trek Original Series shirt with a Federation badge as a belt buckle, said badge pointing down. It’s positioned to either point out that he(?) has pwned Kirk OR to point out his(?) mating prowess OR both. How lively can this charming picaresque get before there’s a firefight and/or a wedding? Mmm, I wonder. The best stories are the ones you wouldn’t come up with by yourself. They lead you off your feet, until you learn to dance like them.